starting point rather than a set of rules that have to be followed. ability to produce something edible without strict instructions. varied to taste, and depending on how many you are serving. Enough Sea Bass to go around – the one above served two, although without any scale clearly difficult o know how big it is! slightly peverse pleasure in doing this myself when I have the time. 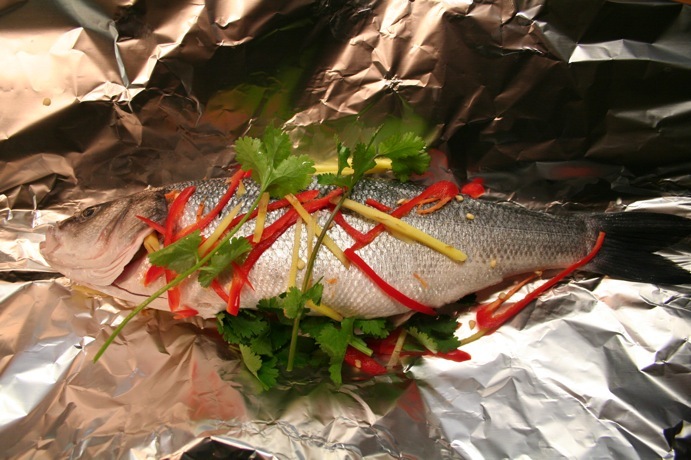 Make an envelope out of the foil, sealing the fish inside. You can leave this for an hour or two, or cook immediately if you want. You want a pan that is going to fit everything in it – we use a deepish wide frying pan – ideally with a lid, although you could use foil to cover the pan as well. Chop the tomatoes into halves or quarters (depending on the size – you don’t want the pieces to be too small), and chop the anchovy as well, and add them both to the onion and herbs/spices. Season the mixture to taste. Spread the tomato/onion mixture over the base of the pan, then spread the rice over the top, covering the tomato/onion completely. 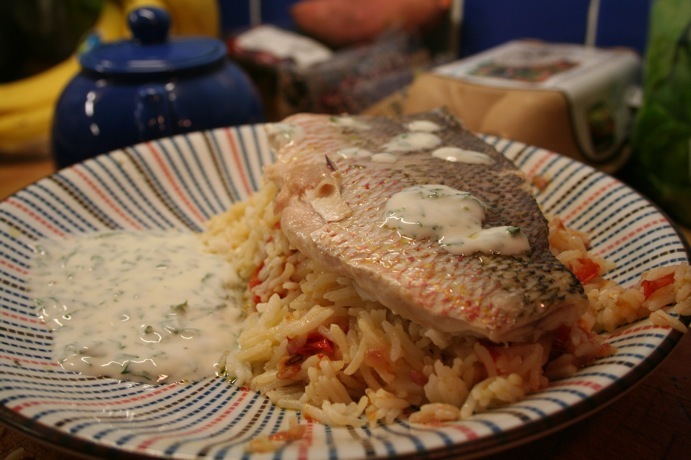 Lay the fish fillets, skin side up, on top of the rice, and cover the pan. Cook on a low heat until the fish is cooked through. You may well want to add a drop of water during the cooking – I usually end up adding half a cup or so. How long it takes to cook will depend on the size of the fillets – 10-15 minutes as a guide. What you will hopefully get is a thick, spicy, jammy, tomato mixture at the bottom of the pan which you can mix through the rice. Serve with a yoghurt dressing – yoghurt, lemon juice, salt, pepper, mint, coriander if you like. I would recommend the original recipe – couscous takes the flavours of the tomato mixture better, and uses fresh fennel to give a bit of an aniseed edge. This recipe is from Dough by Richard Bertinet. I came across this book in Richmond library while actually looking for a Chinese cookery book, and thought it looked interesting. After a few weeks, several loaves, and some overdue fines, I decided I needed to invest in my own copy. Richard Bertinet is a Frenchman living in the UK (around Bath somewhere), and he has some definite views on the way you should bake bread. He dispenses with the traditional ‘kneading’ process, and replaces it with a method where you stretch and fold the bread. For some of the breads I think the technique makes quite a big difference, giving a more open texture. However in this case, the bread has quite a close texture anyway, so I think normal kneading will be fine. If you are interested in trying a different approach, I’d really recommend the book and it includes a DVD showing how to carry out the technique. If you are really interested you can book yourself on one of Richard’s cookery courses! This recipe makes two smallish loaves. Mix the flours together. If you are using fresh yeast, rub it into the flour – like you would butter in pastry. If you are using dry yeast (which I did) just mix in the yeast with the flour – you just want to get the yeast distributed through the mixture. Add the salt, and mix through (do this separately to the yeast, as a concentration of salt can kill the yeast). Then add the water, and mix. You’ll get a slightly wet dough – it will be sticky, but should be firm enough to knead, and as you knead the stickiness will go. When the dough feels less sticky, and firmer, add the chopped apricots to the dough – and keep on kneading to spread them evenly throughout the dough. 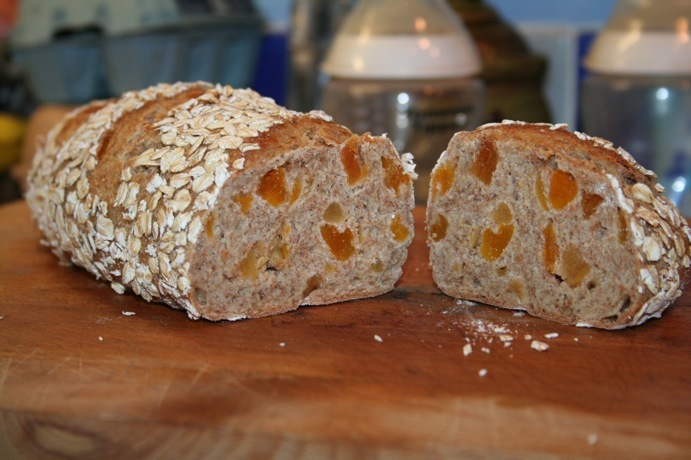 I usually flatten the dough, put the apricots on top, then fold the dough over and start kneading again. I have to admit I find the dough slighly more difficult to handle once its got bits in, and find the bits (in this case apricot of course) fall out and shoot across the work surface (or onto the floor). Once you’ve got the apricots pieces mixed in with the dough, form the dough into a ball by flattening the dough just a very little, and then fold in the edges to the middle. Turn the ball over, so you’ve got a smooth side on top. Put the ball of dough in a lightly floured bowl (big enough for the dough to double in size) and cover the bowl with a damp tea towel. You need to rest this in a reasonably warm place for about an hour – until the dough has doubled in size. It really shouldn’t take more than 90 minutes at the very most. If your kitchen is warm this is an ideal place to put it. Once the dough has doubled in size, turn it out and divide it into two. Form each half into a ball, and rest on the side (you may want to flour the side to stop it sticking) – covered with the damp tea towel – just for 10 minutes. 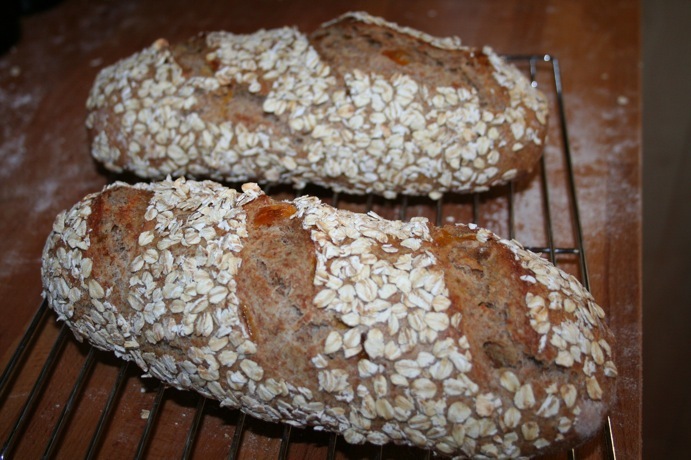 Brush the top and sides of the loaves with water, spread the oats out on a plate, or on the side, and roll the loaves in the oats until they are covered (not on the bottom). Put the loaves on a tea towel you have generously dusted with flour, pleating the tea towel slightly between the loaves so they don’t touch as they rise. Make three or four cuts across each loaf with a sharp knife (again, this helps the loaves rise). Cover the loaves (I usually just fold over the edges of the floured tea towel they are resting on), and leave to rise for another hour. This is often a good point to put the oven on – you want to pre-heat it to 250 Celsius. If you have a pizza stone, you can use this to bake the bread on – put this in oven now so it has plenty of time to heat up. After an hour, put the loaves in the oven – either on a baking sheet (don’t worry about handling the loaves at this stage – they should be quite robust), or on a pizza stone that has been in the oven as it was pre-heated. I also pour half a glass of water into a tray in the bottom of the oven to get some steam in the oven – once again, to help with the rising of the loaf – but you can omit this if you want. Immediately turn the oven down to 220 degrees, and bake for 25 minutes. Take the loaves out of the oven – check they are cooked by tapping the bottom of the loaf with your fingers – they should sound hollow – if not, put them back for another 5 minutes or so. Cool the bread on a cooling rack. Dinner tonight was a version of Russian Fish Pie, the recipe is from ‘Tana Ramsay’s Real Family Food: Delicious Recipes for Everyday Occasions’ and is salmon encased in rice in puff pastry. As we no longer have this cook book (had to go back to the library) I have no quantities for the ingredients, I tend to do this just by eye. 1. Roll out a third of the puff pastry into a rectangle, this will be the base of the dish, then place in oven (200c) for 10-15 minutes till brown. 2. 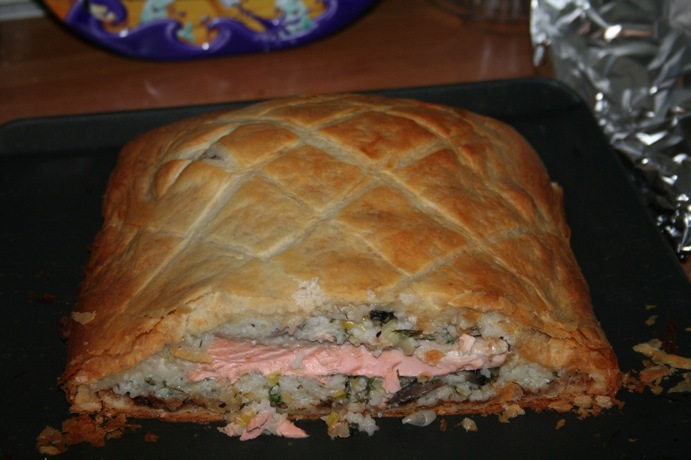 Cook enough rice to cover the base of the puff pastry and the salmon. I use basmati rice, which I wash thoroughly then fry in some oil with star anise and cinnamon before adding enough water, once water is boiling reduce heat and leave to simmer. When the rice is just about cooked, turn off the heat and cover pan with foil then the lid, the steam should then continue cooking the rice. 3. Fry the leeks and garlic till soft, season, add thyme and mushrooms and continue cooking for a few minutes. 4. Add salmon to the pan, on top of mushroom and leek mixture then put the lid on and let the salmon cook for 10-20 mins. Once cooked remove the salmon and take off the skin. 5. Add remaining mushroom and leek mixture to the cooked rice and combine with dill and creme fraiche, the mixture should be a thick consistency. Add a layer of rice mixture on top of the cooked pastry, add the salmon then cover the fish with the rice mixture. 6. Roll out remaining puff pastry and cover the dish, then bake in over for 15-25 minutes. This dish works well on its own, you could add some capers or green peppercorns to the rice mixture for some added bite. This blog was originally intended to be a ‘personal’ blog, complementing the professionally oriented ‘Overdue Ideas’ blog. However, we never really managed to keep this up to date – partly because of time, but I think mainly because there was no natural audience for the comings and goings of our everyday lives apart from close friends and family – who already knew what we were doing. 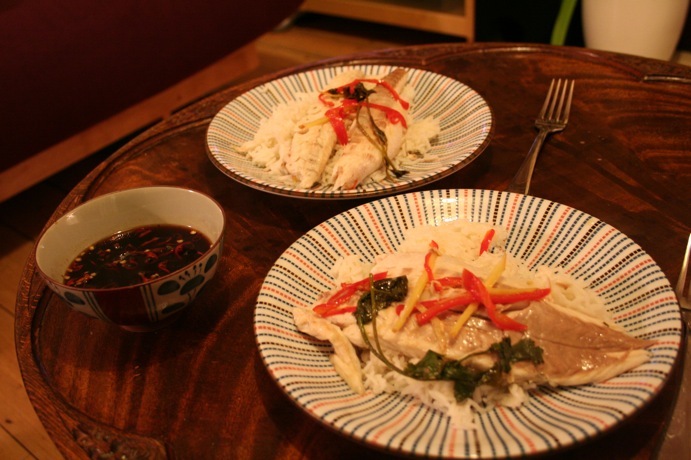 Recently I tweeted what I was cooking for our evening meal, and got a couple of requests to share the recipe, and it made me think that perhaps it was worth resurrecting this blog as a food focused blog. This was there will be a reason to blog on a regular basis (after all, we eat every day, even if it isn’t always that interesting), and if no one else is interested we can look back and see what we’ve cooked, and what we thought. This is actually a simple variation on a Waitrose Recipe card for “Mushroom and Chestnut puds”. I was originally going to follow this directly, but I initially had difficulty finding the chestnuts, and decided to try it out with pickled walnuts instead. The results were good, although we both felt that the walnuts were a bit to vinegary, and if I did it again I’d probably cut down the walnuts and mix with chestnuts – I do think the walnuts add something a bit extra to the recipe. The original recipe makes two small puddings (300ml each), but I made one large one. Anyway, the recipe here is as I cooked it. The other thing about the recipe that I was both pleased and suprised by was how easy the suet pastry was to make – and how light it turned out – my first attempt at a suet pastry and I was really pleased with it. You will also need a 600ml ovenproof bowl – greased with olive oil, some kitchen foil, some string, a saucepan (with lid) large enough to accommodate the bowl and a steamer or trivet. Mix the flour, a pinch of salt and suet in a bowl. Add about 100ml (or a bit more if needed – I would guess I actually used more like 110ml in the end) cold water and mix to a dough. The original recipe describes this as a ‘stiff’ dough, but I would have said it was slightly wet (compared to a normal pastry anyway). I then wrapped this in clingfilm and put it in the fridge to rest. Slice the walnuts (about half a centimeter thick) – don’t worry if they disintegrate a little. Chop the mushrooms into chunks – a little bigger than bite sized – fry in olive oil until they just start to go golden (a few minutes). Crush the garlic, add to the mushrooms and continue to cook for about another minute. Add the sliced walnuts, the tomato puree and the red wine. Season with a pinch of salt (I think I overdid this a bit, so I’d just add a small pinch now, and season again towards the end), and a generous grinding of pepper. Bring the mixture to the boil, then reduced the heat and simmer for about 5 minutes, then take off the heat. Get the pastry out of the fridge, and remove about a quarter and put to one side. Shape the remaining dough into a ball, then roll out into a circle, until it is big enough to fit the bowl with a little extra over the edge (don’t forget to grease the bowl with olive oil). Line the bowl with the pastry. With the smaller piece of dough that you reserved, roll a circle large enough to cover the top of the pudding. Pour the filling into the lined bowl – you may not need it all, I would suggest not filling quite to the top, as my pudding leaked a little in the end. Wet the edge of the pastry around the rim of the bowl, and push the pastry cover down over the top making sure it seals all the way round. Trim away excess pastry with a knife. I was worried when I poured the filling in that the liquid would just soak the pastry, but this didn’t happen I’m glad to say. Cover the pudding with an oiled piece of kitchen foil, and tie this into place with string. Place the pudding on a steamer/trivet in a large saucepan with water in the bottom, put the lid on, and bring to the boil. Steam the pudding for about an hour – check regularly to make sure the water doesn’t boil dry – just top it up if it looks like this might happen. Take the pudding out of the steamer, loosen around the rim with a knife, put a plate over the top, and turn over. Lift the bowl off (I found this very difficult with a hot bowl and rather clumsy oven gloves) and hopefully you will be left with a perfectly formed pudding. We served with boiled potatoes, but some greenery – perhaps some broccoli – wouldn’t go amiss.